You can set a number of preferences to make Stay work in a way that better suits you. 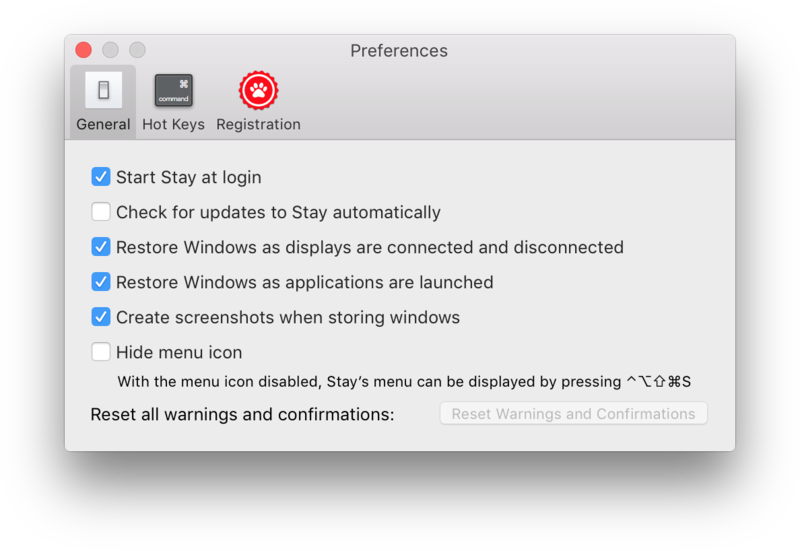 Stay’s General Preferences window is shown below. When enabled, Stay will run automatically every time you log in. When enabled, Stay will check for updates at launch, and once daily while it’s running. When enabled, Stay will restore windows whenever displays are connected to or disconnected from your computer. Stay will also restore windows if the resolution, position, or mirroring state of any connected display changes. When enabled, Stay will restore windows whenever applications are launched. Stay will only restore the windows of the application that has been launched; it will not restore all windows for all applications every time an application is launched. Note that if an application takes longer than five seconds to launch, its windows may not automatically be restored. When enabled, Stay’s icon will not appear in the menu bar. With the icon hidden, Stay’s menu can be accessed by pressing the display menu hot key. This displays Stay’s menu at the current mouse location. Note that if the display menu hot key is not set, this option is disabled. By default, Stay displays warnings when storing or linking windows will overwrite existing stored windows. Similarly, Stay displays confirmations when windows are successfully stored. Warning and confirmation windows can be selectively hidden, and pressing the “Reset Warnings and Confirmations” button will cause all warning and confirmation windows that have been hidden to be displayed again, as they are by default. When there are no hidden warning or confirmation windows, the button is disabled.